I kept wavering back and forth over whether I liked, loved, or…disliked this book. I think the writing was great. The story was interesting. The characters drew me in. The dialogue felt genuine. The polo background is a new one for me. And all in all, I’d be perfectly satisfied with this story of young love, lost love, and reunited love. Preston is 16 yrs old (Konrad, 21) when they first consummate their relationship. And I am just NOT ok with this. Call me a prude. Tell me I’m overreacting. But…um…it’s against the law and…it’s wrong. So, I struggled there on my high-horse, so to speak. And it niggled at me throughout the rest of the book. I couldn’t let it go. When they’re eventually found out by Preston’s awful bigoted and abusive father, Konrad is forced to join the military and is shipped off to fight in the war. I won’t tell you the rest of the story to avoid spoilers. But…I my heartstrings were tugged at…and I was very very happy in the end (despite my earlier irritations – see? Confused how I feel about this book!). If I could change 2 things about this story to make it PERFECT-FOR-ME (I know, I know…this story isn’t MINE to tell, it’s the author’s…but…if I could…), I’d have had the two of them wait until Preston was legally old enough to be in the relationship (it would make me respect Konrad more, to be honest) and also…well, I just wouldn’t have waiting SO MANY YEARS between the beginning and the end. Something about that didn’t jive for me…it felt almost too long to be…apart. 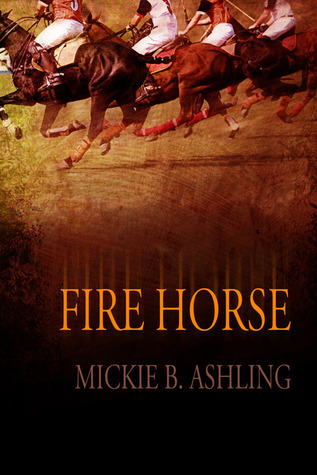 I just read Fire Horse and Ride-Off, the sequel, this week, Susan, so it’s all really fresh in my mind. I understand your thing with the age, which is always a thing for me, too, but I felt like the author tried to get us over that with how Konrad had always protected Preston (we know Kon’s not trying to hurt Pres because over and over he shows his care), how Preston is very headstrong in all his decisions (he goes after everything he wants and doesn’t back down consistently), and how the author had Pres actually messing around and on his own for two years before anything happened between the two, while also throwing in that age of consent in another country in. Obviously there’s still a power differential here, because of Kon’s age and experience, but let’s face it, the whole story hinges on Kon giving in to Pres, and he certainly suffered for his decision to give in to both their desires. If that doesn’t make it OK, it certainly allows for character & story development while still being true to life. I think Kon would agree with you that he should have waited longer. I’m with you on the SO MANY YEARS thing, but at least we didn’t have to suffer through that time along with Preston. I think my problem with that was how short the story is for after in comparison to the before. It felt unbalanced to me, so much that I’d say I got 80% goodness from reading it, which would match up with 4 stars. So, I agree with you there, too. I don’t want to say anything about Ride-Off, but I’d be really interested in reading your thoughts about it. Carolyn! I love your comment SO MUCH! Because you’re absolutely RIGHT in everything you mentioned. And that’s why I was so conflicted. Because despite having a real issue with the underage thing, I actually really loved how the author dealt with it…both in decisions and in consequences. I think that was what made this a 4-star read for me and not, say a 3-star. Glad you enjoyed this too! I’m starting book 2 tonight! I’m really looking forward to it! This entry was posted on August 4, 2014 by BioB in Cops / Cowboys / Military, Reviewer: Susan and tagged 4 Stars, dreamspinner, mickie b. ashling.